So two or three months ago, I was invited over to try out the multi-player for Assassin's Creed: Brotherhood. It was a weird bit of multiplayer in that the objective is to walk around in crowds of people and try to go unnoticed until you find your target player and stick a knife in his eye. And I said, "OMG, I want to jam knives in skullz every day!" So jumping into the first game, I admired the control scheme, but the game quickly descended into a monotony. It wasn't truly horrible, but I always felt like the good stuff was being dangled right out of my reach. And then, the LONG horse rides from area-to-area. I was quickly losing interest. I shared my pain with my roommate; he said he'd played one and didn't like it either, but that he found the second one to be much better. So I popped in part two... and this was more like it. 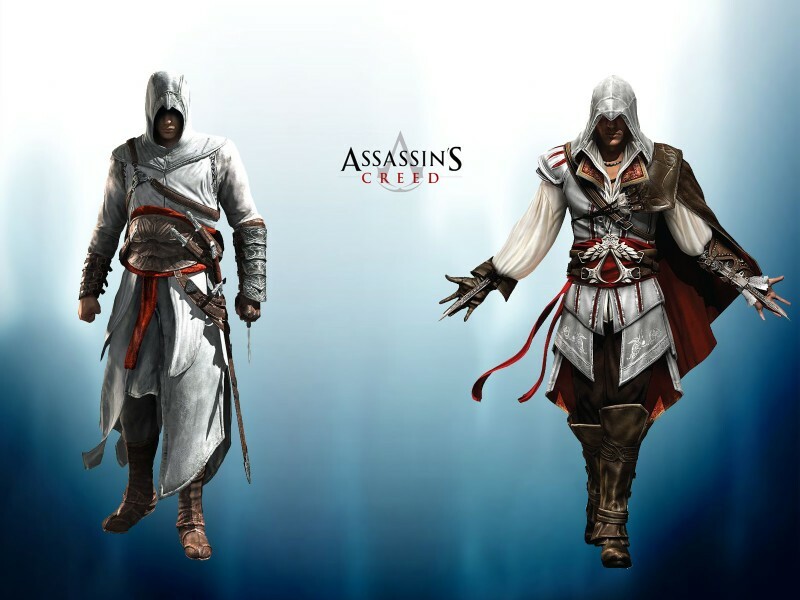 It's just too bad that I'm missing out on the Altair story, since part two and brotherhood center around the character of Etzio. The biggest problem I have with the second one is that they have these stealth tools introduced in the first game that have no longer have a place. Why should I sit on a bench when the best stealth is to kill all the guard before the next guard gets there? And even if I get attacked by a dozen guards, I'm better served to fight them all off rather than using the run-and-hide gameplay that they went to all the trouble to create. But hell, I'm having lots of fun running around stabbing guys and fighting off hordes of guards, so no foul there. I just like stealth gameplay, and wish I'd had more incentive to do so... although I suppose I could be playing the game any way I like, for the most part. And since I didn't clarify this before... the gameplay... what makes this game so much fun and sets it apart from other games I've played, is that you simply press a button and move in the direction you want to go, and Altair/Etzio will find the appropriate handholds and footholds, and climb like a hyperactive monkey. There is a bit of a learning curve in terms of jumping across rooftops without falling, and finding the 'path' to climb the tallest buildings is a fair bit of fun. There's also a lot to run around and do to get distracted.... for one is your villa, wherein you can invest money to make it nicer when you return to visit, and it returns money. I suspected that if I invested in my villa rather than equipment upgrades, that it would pay back later in the game, and it did in spades. By the time I reached the fifth DNA sequence, I had maxxed out the villa... I was investing almost everything I made back into the villa, and also hunting out every treasure I could find in an area. Money was no longer an object at that point. It gave me a sense of satisfaction, but it was also a little too easy. I wanted more from the villa-building aspect of the game. Another fun side piece was invading the tombs of old assassins to unlock the best armor in the game. It was very Prince of Persia-like without the death-traps... and is has me thinking that since I never played a Prince of Persia after Sands of Time, that I think I'd like to go play the HD upgrades they just added to the Playstation store. A couple other side-diversions are going and finding secret messages hidden in your memories by a previous lab rat, sneaking past guards to get ancient manuscripts that you will need to finish the game, and climbing all the biggest buildings... in part because it reveals the map, but also because it's just fun to see a large tower and say, "I'm going to climb that!" I also appreciated the storyline... basically you are modern-day guy in a science lab, being forced to explore the memories locked into your dna. I think that's a pretty great premise; I think they're trying to turn this into a movie and I would be happy to check it out. And so the story of Etzio in part 2 is told over the course of 14 "DNA sequence" chapters. Except... when you finish eleven, you're informed that 12 and 13 are corrupted, and we're skipping to 14, but my operators really wanted me to know how cool 12 and 13 were. I smelled sales pitch, so I went online and, sure enough, 12 and 13 were for sale, along with three "templar lairs" that were bonuses included with some versions of the game. I was initially annoyed, but hell, all three items were only about five dollars (though I think it was twice as much initially). The templar lairs were basically three more 'tombs'. One was ridiculously easy, but even in that there was some joy in running through the 'maze' like an assassin god. I think all three took me about an hour not including travel, and not a bad way to blow a buck-fifty. Chapter 12 involved helping an ally retake her town which had been overtaken... it was nothing special, and I felt like it justified one of four towns in the game that you only travel through in the main game. It seemed weird to me that they introduced this area, then I immediately traveled to another area, and kept wondering if I was ever going back... and if not, why did they even include it? Overall, I didn't feel like it was anything special... but I spent $2 on a little over an hour of gameplay, and it was not money wasted. Chapter 13 started off leaving a sour taste in my mouth... "So stuff happened that we're skipping"... grrr... the plot of this one, taking place during the historic Bonfire of the Vanities, involves hunting down the "mad monk" and his nine lieutenants. This was a lot of fun. Some were really easy...they just tried to run away and i flew over and stabbed them before they could take more than a few steps... others required me to sneak up on them, and took a little trial and error. As I went through this, I really felt like they were putting their best foot forward as this was the last downloadable piece. The weird bit about it was that they were selling this to people who had already finished the game.. and so the end had a certain sense of finality... but me, I downloaded it to play before I went onto 14, and so it had a somewhat disjointed feel as I went onto the last chapter. So whereas one might pass on chapter 12 and the templar lairs, I would say 13 is a piece you definitely want to play if you enjoyed this game. But again... $5.50 for the whole bag. Just do it. Assassin's Creed: 2.5/5 stars... I'm truly surprised this game is rated as well as it is... but if it weren't for those people, I wouldn't have gotten a sequel. Assassin's Creed 2: 4.5/5 stars. Love it... only marking it down because I feel like they made fighting a little too easy thereby taking away the stealth emphasis. And I've already grabbed Brotherhood and am loving stabbing strangers across the globe. Currently playing Sequence 7 of brotherhood. I heard it only had 9 sequences? Monotony was always threatening to loom in all of the games, and "difficulty" doesn't seem to be in any of their vocabularies. However, yes, nice reviews - you really do seem to have this downpat.